Home Product Description Bulldog Brews Perfect Apple Cider Kit – 3kgs! Product Description Bulldog Brews Perfect Apple Cider Kit – 3kgs! 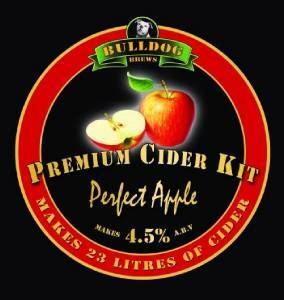 Product Description Bulldog Brews Perfect Apple Cider Kit  3kgs! Bulldog Brews Perfect Apple Cider Kit – 3kgs! Based on an unprecedented amount of apple concentrate, this kit includes all you need to make the perfect cider. All ingredients are in the box - just add water. Bulldog Brews Cider Making Kits are extreme in everything - the amount of raw material, the specially developed cider yeast, the delicate cider recipes used. Brewing made simple - just add water and your cider is ready in about 7 days. The Bulldog Brews Perfect Apple Cider Kit has been developed with no compromises. Using the best apple juice available to produce an amazingly natural and fresh apple cider. It includes a new type of dried yeast, especially suitable for cider. This yeast promotes the fruitiness in the apple base much more than if you use normal wine yeast. This kit requires no sugar addition - all you need is there (a very small amount of sugar required at the end for priming (to make it fizzy). Spend £28.94 more to reach FREE SHIPPING! Continue shopping to add more products to your cart and receive free shipping for orders over £200.99.